What is Hardness of Water in Textile Industry? The presence of salts of calcium or magnesium in water is responsible for the hardness of water and leads to the formation of insoluble precipitates with soap. These may be deposited on the goods, thereby assisting soiling and even impairing handle of the cloth. Usually they are not deposited evenly and are one of the causes of poor leveling in subsequent dyeing. Moreover, these salts may precipitate some dyes during dyeing, or form complexes resulting in dulling of shades. Other metal salts, such as iron and strontium, may also contribute to hardness, but they are generally present in smaller amounts as compared to calcium and magnesium. Iron salts are, however, very harmful in textile dyeing and are responsible for dulling of shades. Two types of water hardness may be distinguished in textile industry. One is temporary and the other one is permanent. Temporary hardness arises from bicarbonates, and can be removed simply by boiling when the bicarbonates precipitate as carbonates. It is a contributory factor in the formation of scales in boilers, which is a deposit, amongst other things, of calcium carbonate and magnesium hydroxide, the latter is a decomposition product of magnesium carbonate. Permanent address is associated with sulphates and chlorides of calcium and magnesium. These are highly soluble in water and expulsion of dissolved gases makes no difference in their solubility. These require chemical treatment for their removal. Most waters contain both temporary and permanent hardness, but the proportion of the two varies. Irrespective of the salts present, hardness is expressed in terms of calcium carbonate. Hardness may be expressed in degrees or in parts of per million. Units of hardness vary from country to country and some of them are listed in the table. In British usage, water of 0°-4° is soft, 4°-7° moderately hard, 7°-20° hard and ˃20° very hard. It follows that 2×282gm of oleic acid is equivalent to 100gm of calcium carbonate. Standard soap solution is prepared by dissolving pure oleic acid in alcohol and made neutral to phenolphthalein by stirring into concentrated potassium hydroxide solution until a pink color appears, which discharges with just enough oleic acid is finally. The solution is then diluted with a mixture of alcohol and water (2:1). The solution is standardized against calcium chloride. Soap solution is used, generally, to determine to total hardness only. The test method is very simple but the accuracy is limited. More accurately, hardness is estimated by titration with standard EDTA (Ethylene-di-amine tetra acetic acid) solution (Disodium salt). Buffer is prepared by dissolving 6.75gm pure ammonium chloride in 57ml of ammonia and remaining water to make 100ml. Buffer tablets may be used. Indicator is prepared by mixing 0.5gm Solochrome Black WDFA (ICI) or Eriochrome black T (Geigy) (C.I. Mordant Black 11, 14645) with 4.5gm hydroxylamine hydrochloride and the mixture is dissolved in 100ml water. The dyes, blue in alkaline solution (pH 10), forms a red complex with Ca or Mg ion. During titration, these metals combined with EDTA in preference to forming the dye-complex (Red). Consequently, the blue color of the dye reappears. A known volume (50ml) of the water sample is taken in a conical flask. 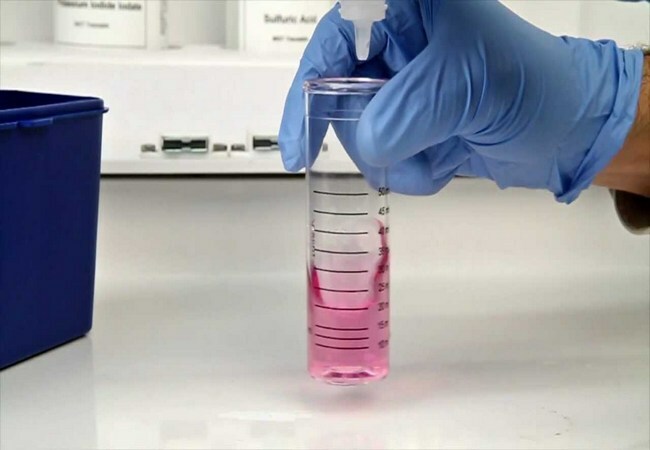 2ml of buffer and 4-6 drops of the indicator are added and titrated until red or pink color of the solution turns blue.